Saturday December 24th 1921 It was two years today since Mr Haskins finished The Withrow monument. The folks busy with Christmas Preparations. I looked over Iowa City papers. Harry & Mable came before supper. They went with The Girls to The Community Tree. Sunday December 25th 1921 Christmas Day. Websters were out. We had a good dinner. Laura at the church part of day. All to church in evening. Monday December 26th 1921 The Pawnee folks went home this morning. I got a lot of mail. Crotcheted some. Vene tired. Every body resting. 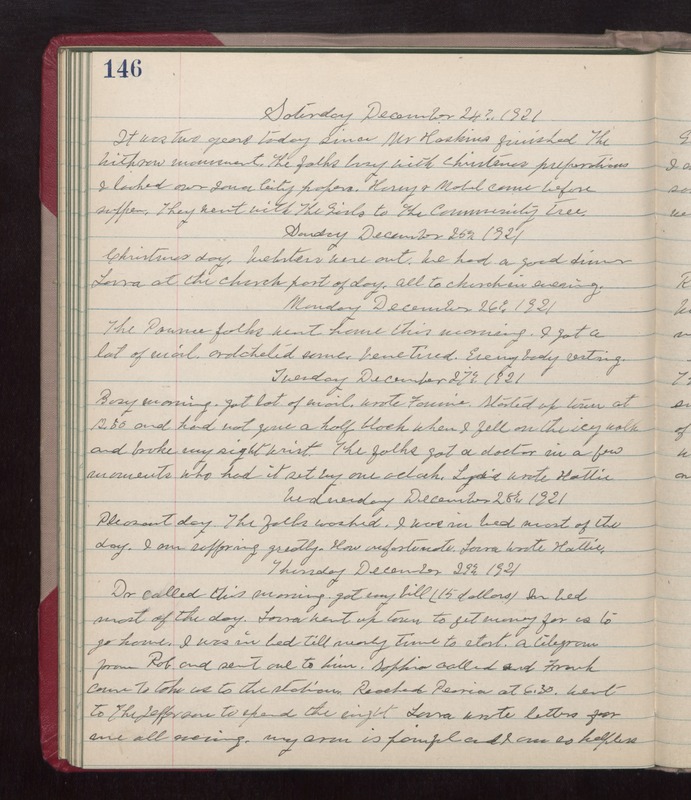 Tuesday December 27th 1921 Busy morning. Got lot of mail. Wrote Fannie. Started up town at 12.50 and had not gone a half block when I fell on the icy walk and broke my right wrist. The folks got a doctor in a few moments who had it set by one oclock. Lydia wrote Hattie. Pleasant day. The folks washing. I was in bed most of the day. I am suffering greatly. How unfortunate. Laura wrote Hattie. Thursday December 29th 1921 Dr called this morning. Got my bill (15 dollars). In bed most of the day. Laura went up town to get money for us to go home. I was in bed till nearly time to start. A telegram from Rob and sent one to him. Sophia called and Frank came to take us to the station. Reached Peoria at 6.30. Went to The Jefferson to spend the night. Laura wrote letters for me all evening. My arm is painful and I am so helpless.